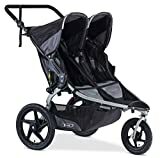 Thule’s Urban Glide Sport Stroller offers many premium features of a jogger stroller that just can’t be found on other double strollers sold today, and their reputation for quality sporting and transportation equipment and accessories is second to none. It is super lightweight, folds easily, and offers one of the most comfortable rides and pushing experiences available on the market today. If you need a double stroller that fits your busy lifestyle, the Thule Urban Glide Sport Stroller is the right choice for you. When you have a very active lifestyle that includes two infants, toddlers, or young children, you need a stroller that can keep up with all of you without sacrificing features or quality. You need big wheels, rock solid construction, lightweight design, and essential extras like storage space, canopies, and car seat compatibility. 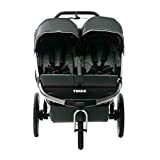 Your stroller also needs to be easy to steer, ride well so your babies are not jiggled into jello when riding over rough terrain, and you need to be able to fold up and stow the stroller by yourself. 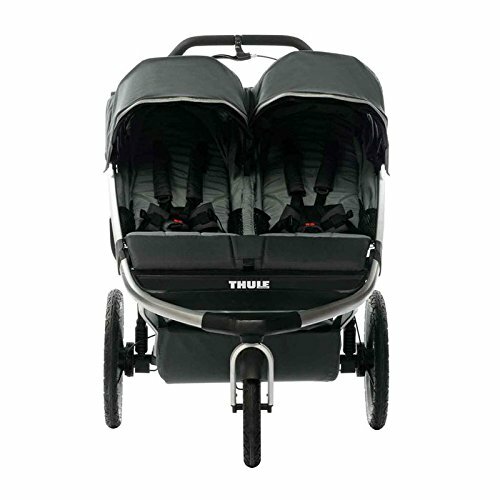 Fortunately, Thule makes the Urban Glide Sport Stroller for families just like yours. 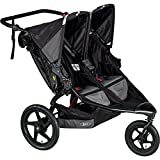 Let’s get an overview of the key features so you can better evaluate how this modern marvel is everything you could ever want or need to be in the running as the best double stroller for jogging. This three wheel jogger makes an excellent choice if you tend to make frequent trips to the park for daily runs or play dates. The front wheel unlocks for easy swiveling when you need to maneuver through tight spaces, and re-locks when you need to keep moving continuously, such as on your morning run. The rear wheels have their own suspension system to smooth out bumpy rides on rough sidewalk or walking trails, and the wheels are large enough to handle most stairs, curbs, and elevated platforms with ease. A quick test run around the store or around the block is usually enough to convince anyone looking to buy, that this is the stroller for them. One of the most overlooked features on most strollers is the push bar on just about every double stroller on the market today. Just like children, parents come in all shapes, sizes, and heights, and having a fixed push bar can be very hard on the arms, shoulders, and back when you have to cover extended distances, or when you make your daily run a family affair every day. Rather than suffer through the aches and pains of an awkwardly adjusted pushbar, Thule has designed the Urban Glider Sport with an adjustable height push bar with an extra-comfortable foam padded grip so that you are not fighting carpal tunnel syndrome and runner’s fatigue at the same time. The advantages to being able to pop your infant’s car seat out of your vehicle and drop it right into the stroller where it locks instantly cannot be overstated. Fussy kids who are ready to be out of the car and on the move are often very vocal about their unhappiness, and you often spend almost as much time soothing the crankies as you do getting them seated in the stroller and ready to roll. Having a universally adaptable mounting system in your stroller is a must-have feature, and Thule’s unique design and easy to use adapters make transition from car to stroller a literal snap. Lugging a diaper bag over your shoulder in addition to your purse or backpack or whatever else you need with you for running errands or heading to the park is a whole lot of strain on your back and shoulders your body doesn’t need. The Urban Glide sport has a capacious cargo compartment underneath the seats where it is both easy to reach and can hold all additional necessary outing accessories securely. Just tuck all of your belongings in and roll out on your latest adventure with minimal fuss and struggle. This is a feature you absolutely cannot compromise on. One-handed folding on any kind of stroller is a must have, but with bulkier double strollers you need to be able to fold and stow your stroller one-handed with ease. Thule’s one handed lock and unlock folding mechanism makes it easy to handle prepping your stroller for arrival or departure with just one button press, turning what is ordinarily a chore into a very brief and easy part of your errand running or outdoor adventuring.